Known for its light, moist, tender texture and rich flavour, chiffon cakes are so versatile and are always made with oil, not butter. It gets its height and airy texture from whipped egg whites. The cake needs to be turned upside down immediately upon removing it from the oven as this keeps the cake from shrinking and losing its volume as it cools. To dress it up, you can pour a beetroot glaze over the top or decorate with buttercream frosting. I like to dust the top of the cake with powdered sugar and it is great when served with fresh fruit and whipped cream. On February 19, the Chinese New Year will be celebrated and I would like to take this opportunity to wish you all happiness and prosperity in the coming year of the SHEEP. Sift the flour twice into a mixing bowl. Add in chia seeds. Set aside. Preheat the oven to 160C/320F. Beat beetroot juice, sunflower oil and NuStevia until well combined and emulsified. Add in flour mixture and stir until just combined. Stir in egg yolks and vanilla extract and stir until combined. Combine white sugar, NuNaturals and cornstarch in a bowl. Beat the egg whites and lemon juice on medium-high speed until frothy. Gradually add in sugar stevia mixture and beat until stiff and glossy. Fold 1/3 of meringue into the egg yolk batter to lighten it up, then fold in the remaining meringue and fold until well combined. Pour the batter into an ungreased 10-inch/25-cm tube pan and bake on the lowest oven rack for about 70 minutes until top springs back when lightly touched. Immediately invert baking pan and cool completely. Run a knife around sides and center tube of pan to remove the cake. Serve the cake with some whipped cream and fresh fruit if desired, or simply dust with some icing sugar. A wonderfully fluffy cake! This combination is fantastic and so original. Looks really lovely! Does beetroot juice give any flavor or just a bit of color? @MedejaI don't taste any beetroot there, and it did give it a lovely pink colour before baking. Your chiffon cake takes me back to my childhood. I don't believe I've ever tasted beetroot juice, but It looks delightful. Looks so light and airy! So very pretty! Your cake look light and delicious! Wow, cake looks superb and very very tempting..
Con las semillas chía que bueno. Happy CNY to you as well. This cake looks delicious. Chiffon cakes always remind me of Asia. They are always so much lighter than American-style butter cakes. Wow - Angie I am stunned by the height of this cake! It sounds delicious and do you get beetroot juice from a store or make your own? Did the color from beets juice faded after baking the cake? My thought was beets color don't fade while cooking. I would never think of this combo in a cake; Looks nice and tall! Chia seeds are extremely popular! I really like the texture of this cake and really love the idea of adding these seeds in it. Delicious Angie! What a creative recipe Angie...beet and chia seeds..and the texture of this chiffon cake looks perfect...beautiful cake. Very elegant looking cake! Interesting that the typical beetroot red color didn't show up very much on this cake...intrigued by the looks, gorgeous photos! Hi Angie, chiffon cakes are one of my favorite desserts, yours looks beautiful. Love that you used beetroot juice. This looks so perfectly fluffy! Sounds wonderful! This cake looks divine! Must be so fluffy-))) Love the ingredients also! I haven't had many chiffon cakes in my lifetime and have never made one. This one looks a lot more interesting than some I've seen so it's a great place to start. Love your use of the beet root juice and a beet root glaze sounds pretty darn good! I love this chiffon cake Angie! This chiffon cake looks incredible, Angie! I love that you hid beetroot juice in here, you always have the best healthy recipes! Happy CNY too! Chia and beet juice, eh? This cake is packed with superfoods! What a great version of chiffon cake, which I just love! This must have disappeared quickly. Happy Chinese New Year! A fantastic way to celebrate! Yummy and beautiful! I've always wanted to make a chiffon cake and have often heard how light they are. Yours looks wonderful - with a beautiful texture. Happy New Year to you too Angie! I'll take a slice, thank you. I always am amazed at the chiffon cake, looks so perfect. Gorgeous my dear. I enjoy using beet juice too. Happy Chinese New Year Angie!! Hi Angie, I just wanted to thank you for letting me know about the closed comments on my site. I wouldn't have noticed so quickly otherwise. I have solved the issue now. What a healthy chiffon cake! A gorgeous cake, Angie! I like fruit on my chiffon cakes....perhaps raspberries would be yummy on this one. I don't think I've ever made a chiffon cake. Yours looks wonderful! My mom loves chiffon cakes! She would have used poppy seeds, but I love your use of chia. Gong Xi Fa Cai, Angie. Health and flavourful! You make the best tea match, Angie!! Thank you! I love chiffon cakes! Thanks for sharing this awesome recipe! Your cake looks so perfect! Look how light this cake looks. Happy new year to you as well Angie! 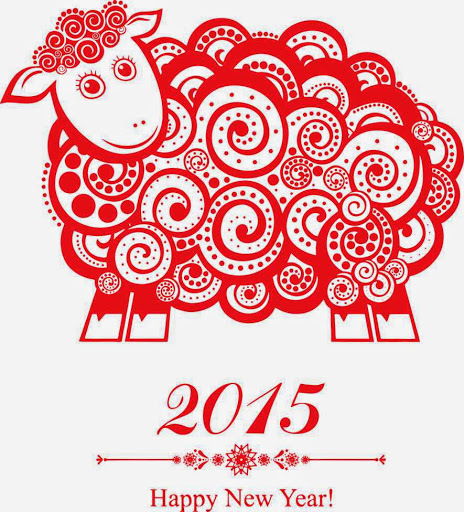 Happy Year of the Sheep! Angie, I love dropping by to see what treats you have whisked up and there is always a new ingredient for me to try. Adding Chia Seed to my shopping list! That cake looks so light and delicious, Angie! Happy New Year!!! This cake looks like it would be perfect with a cup of tea, which is one of my favorite beverages! Gorgeous, Angie! I love the color gradient from the edge into the center. I wish I had a slice of this beautiful cake with my morning coffee, I have shied away from chiffon cake but I really should give it a go! This looks like a very spongy cake. Yum. @Food And Recipes Jeannie Tay I most like to cook Beetroot Chiffon Cake Chia Seed is at home, very tasty and delicious..
What a treat to return from vacation to find this lovely cake recipe, Angie! I love chiffon cakes and the idea of using beet juice and chia seeds. What a gorgeous cake! You always come up w the most amazing recipes! This is a flawless, gorgeous looking cake. I can picture myself with a slice of your beetroot chia seed cake and a good cup of hot coffee. What a lovely cake! I adore chiffon cakes as they are so light. Love that you packed so much flavors in yours. Happy Chinese New Year to you and your family! :) Wish you all the best in the year of Goat! This cake is great. I love cake that are nice and light and not loaded down with lots of frosting. A dusting of powdered sugar is all a delicious cake needs. Angie, that is a very impressive cake indeed! I would not expect a chiffon cake out of these ingredients! Can I just take a minute totell you that I love the lay out of your blog!! Absolute perfection, Angie! I love chiffon cakes…yours sounds amazing! Oh my this looks like the perfect recipe to use up some of my chia seeds thats been sitting there heehee. Love that you didn't use any rising agent for this lovely cake, yum! What a perfect cake to enjoy with a cup of tea on a cold winter afternoon, Angie! Just wish I could sit and enjoy it with you! This is a unique and wonderful combination. Cake looks light and yummy!